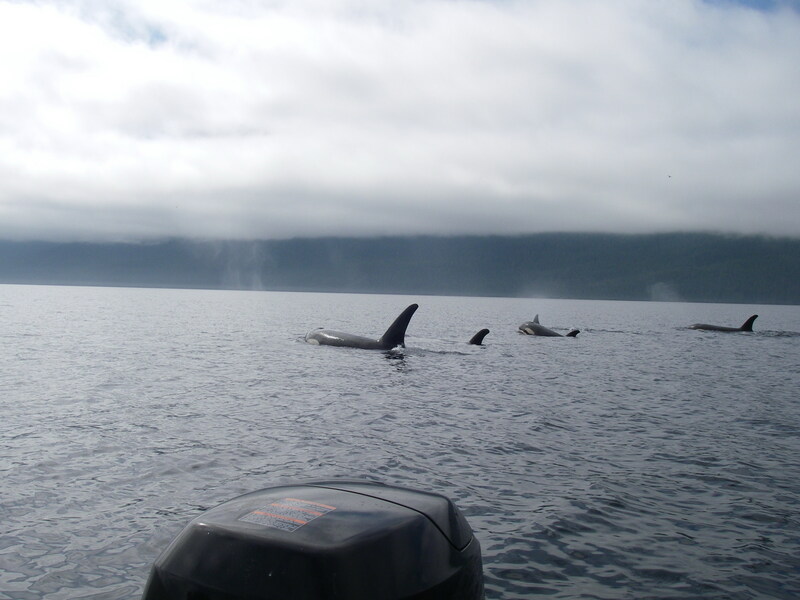 A small pod of resident orca passes behind the boat in a resting line. Like other cetaceans, orca are conscious breathers and must stay awake to breathe. Though they rest, they never fall fully asleep like humans. They synchronize their dives making four or five faster shallow dive then one much longer rest dive. 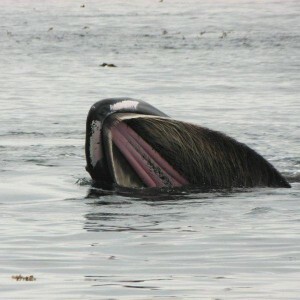 During the longer dive they may travel a hundred plus meters (yards) before surfacing. Resting lines definitely create problem in foggy weather, as it becomes very easy to lose track of the pod. It is said that an orca’s eyesight is equally good in or out of the water. In fact it is thought they use eyesight when ‘spyhopping’ to spot boats that may present a danger. 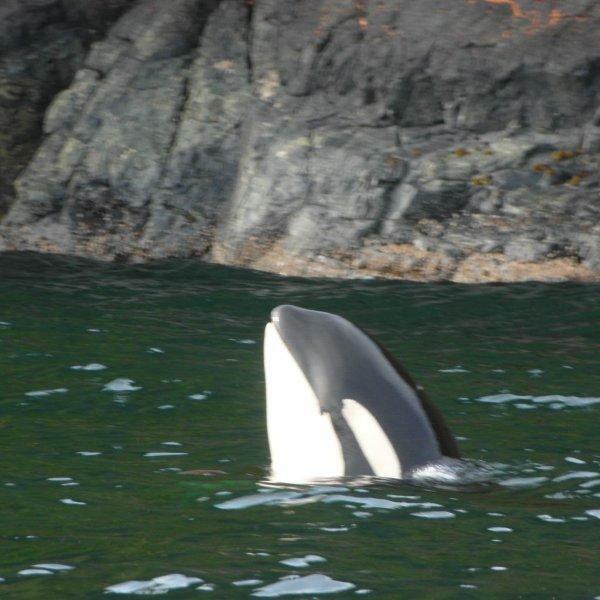 Orca do not seem to fear boats but once a motor is turned off and no sound is coming from the boat it becomes harder for them to locate. “Orcas possess sophisticated underwater sonar that enables them to perceive their surroundings ten times more effectively than our most advanced equipment.” (http://www.orcafree.org) However a boat’s shallow draft may make it harder to locate and thus the need for an occasional spyhop. Great photo from James Wendy of Australia. I am sure that this is not an over active imagination. 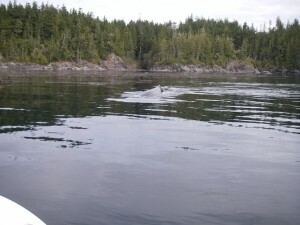 The first photo shows a humpback whale starting a dive not far from our boat. The closeness to the kelp bed and the number of years fishing in the area I know that the water is no over 60 feet (20 meters) deep so the whale cannot dive that deep. 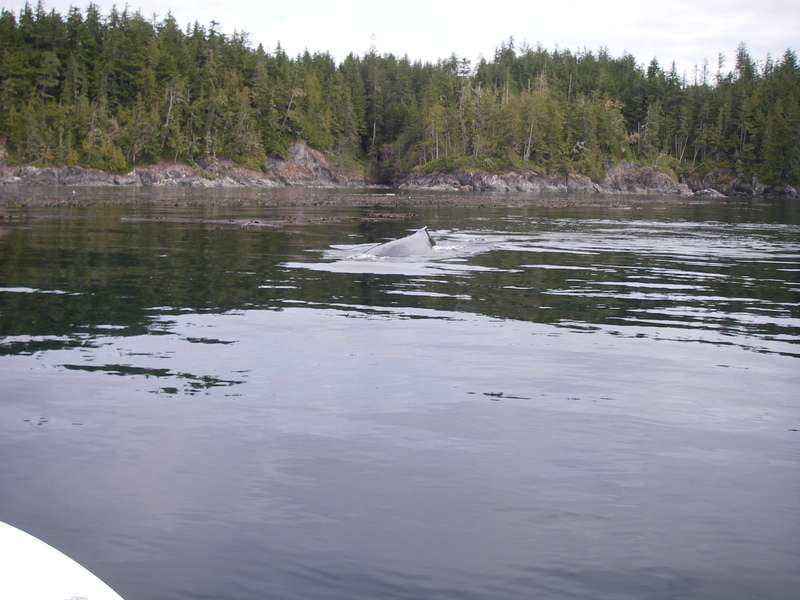 In the second photo just to the left of the bow light one can see several small patches of white on the humpbacks pectoral fin as it passes beneath the bow. If you strain hard enough one can see an outline of the whale; we saw it in real time I just hope the camera has captured the image. 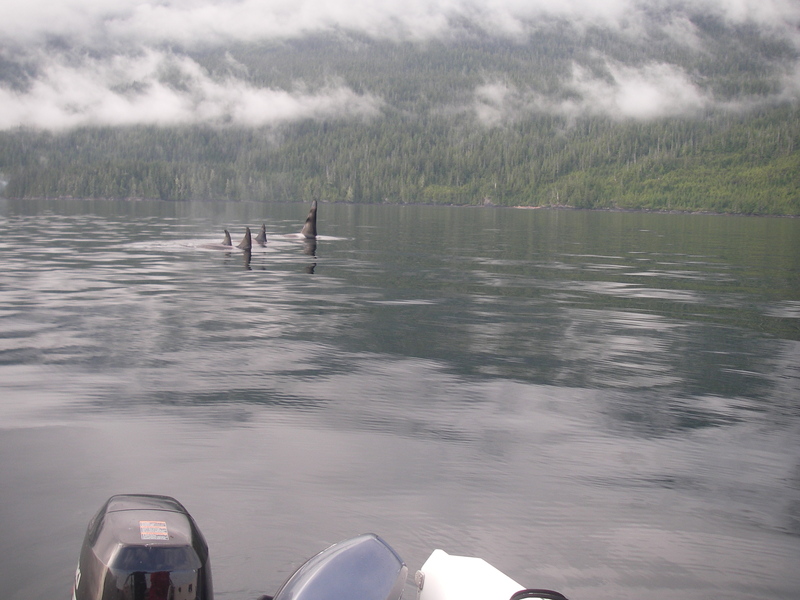 The two viewing stands used by Grizzly Bear Lodge on our wildlife tours in Knight Inlet seem to attract bears. They show no fear of the red and orange suited guests or the click of cameras as they pass beneath the stands. The main attraction is salmon. The grizzly bears have a limited time to add enough fat to survive hibernation. 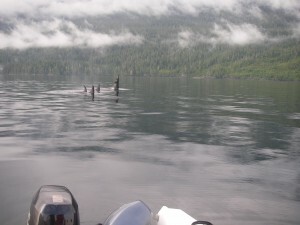 Once the salmon arrive in mid August and we are permitted to use the stands after August 24th we view bears eating salmon. If cubs do not add enough fat they will not survive hibernation and if expectant mothers body fat is not high enough the fertilized eggs will be absorbed and fewer cubs will be born for the next year. Pausing to see the roses does not seem to be an option for grizzly bears this time of the year. 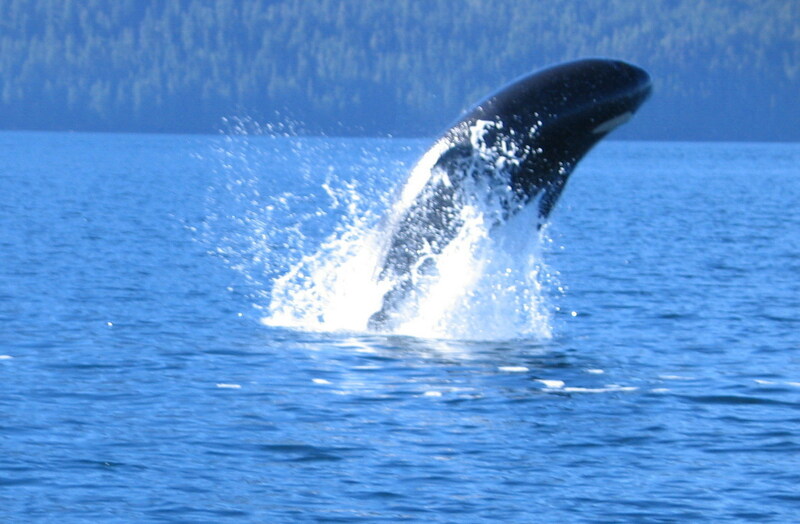 Books on whales and dolphins are full of pictures of breaching mammals. It is hard to imagine the number of hours it took and pictures, which were taken prior to digital camera to get one good photo. Spending three to four months each summer working for Grizzly Bear Lodge with many of those whale watching I know that a breach is not that common. The breaches that occur do not come with a five minute warning in fact most good photos are a result of “right place right time” with allot of luck added. As the tide comes in and access to the protein from turning over rocks is gone this grizzly bear and cubs turn to sedge grass. The grass along the shore of the river estuary is more than a meter (3 feet) high so these cubs are in their second year; first year cubs would be lost in the grass. The sedge grass is 25% protein much richer that other grasses and the best plant proteins available as berries are not yet ripe. 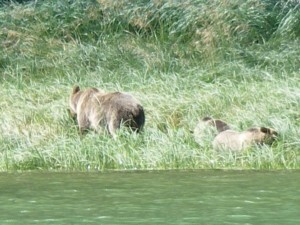 Most of a grizzly’s springtime is spent in search of food as fall and the salmon approach this changes. 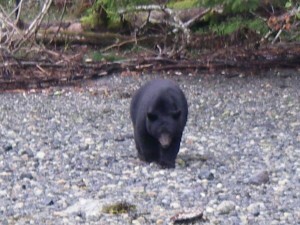 Not the sharpest picture but it was taken in mid September to show a black bear with enough fat to hibernate. This bear is big enough to challenge a sub-adult grizzly. Several years ago there was a large black bear that did just that for the first part of the viewing season in the Glendale River estuary, the main area for observing grizzly. 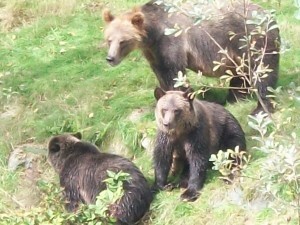 The first part of the season is mostly mothers with new and one year old cubs and some three and four year old grizzlies. The black bear mentioned managed to claim its part of the beach until one of the breeding male grizzly appeared and that was the last we saw of the black bear. It is interesting to note that the bear in this picture does not have access to the salmon rivers because of the grizzlies so its bulk is from grass, beach protein and berries. Once the berries appear in June they last through the fall. There are a variety of berries including; huckleberry, salmonberry, blackberry, salal berry, thimbleberry, and elderberry all within a short walk from the lodge. 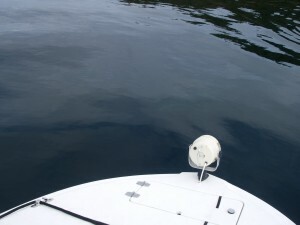 The overcast day may not seem too appealing unless you think about taking pictures from a boat. On bright days it is necessary to have the sun at your back or the reflection off the water will make picture taking difficult if not impossible. Marine mammals often change their direction of travel without notice and do not always cooperate in getting the boat in the right position. On a dull day their cooperation is not necessary. Again the motor in the picture is to provide an indication of the nearness of the orca pod. Not quite as dramatic or exciting as the previous post and the humpback whale visiting but still unique. 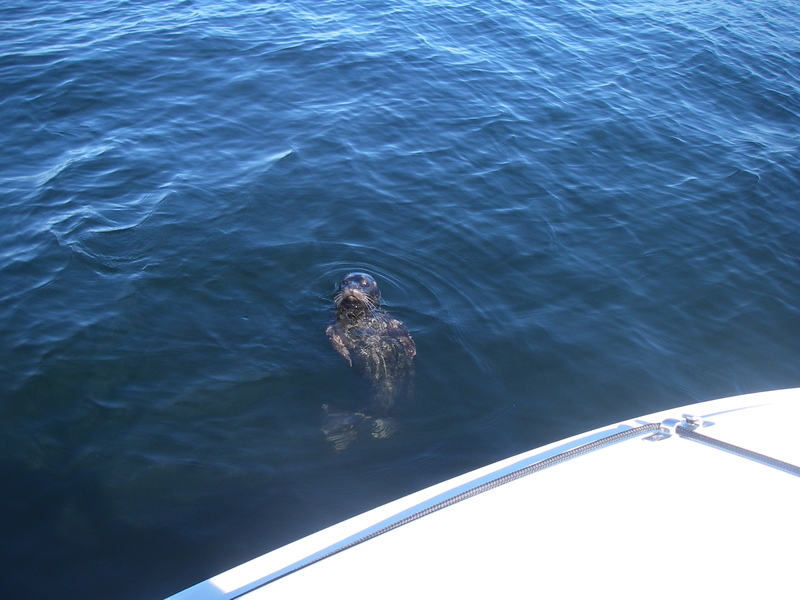 Another day and a picnic with a visit from a harbour seal. This is the only time I have had a seal intentionally come this close. Harbour seals by nature are very timid and shy away from boats. However this one appears small and therefore young and may have not learned to fear boats. The advantage of sitting quietly and having lunch in an area with allot of marine wildlife. Bob and Helen Everson captured a quite moment in the stellar sea lion rookery. A few sea lions are in our viewing area all year however the prime time is spring and fall. 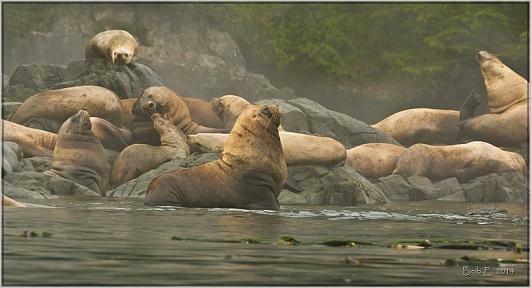 The stellar sea lions that migrate between California and Alaska use the waters off the East Coast of Vancouver Island as feeding and resting area on their migratory route. The rookery is normally a hub of noise and activity as sea lions fight for prime real estate in the rookery and the juveniles thrash about in the water. Although there may be an absence of noise I can assure you the same is not for the smell.